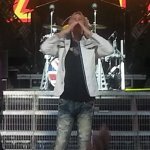 Def Leppard and KISS continued the Summer Tour 2014 last night in Irvine, CA with another unchanged 14 song set played. The band played another 75 minute set at the Verizon Wireless Amphitheater. The show started with the live snippet of 'Won't Get Fooled Again'. Vivian was celebrating marrying to his girlfriend Caitlin the day before in Los Angeles (mentioned on stage by Joe). He was also seen with a shaved head again due to his ongoing treatment. Something he had to do in Summer 2013 on the last tour. Joe mentioned the filming of the 'Two Steps Behind' video at the venue 21 years ago in 1993 (10th July) before playing the song. The next show takes place (later tonight) on 6th July in San Diego, CA.